Envirosafe Ireland provides IE Instrument Enclosures which are larger versions of ST1 enclosures and are designed for operations that require more room or higher arm access e.g. 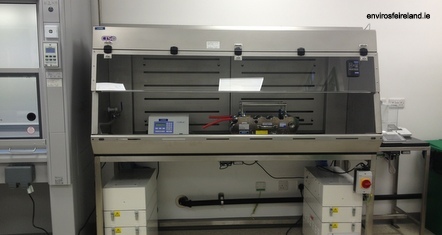 Karl Fisher, Particle Sizers, Pipetting, FTIR, Mobile Phase Separation etc. They can also incorporate point extracts which can be targeted at specific areas of concern. IE Instrument Enclosures are specifically designed to enclose instruments used for handling or analysing chemical and hazardous compounds.